Portlandia received many a giggle last season with its “Put a bird on it” sketch, poking fun at the art and design communities’ penchant for bird motifs. That being said, we’ve got a few favorite bird pieces ourselves. Tomorrow marks the second-season premiere of Portlandia, the IFC sketch-comedy show with Fred Armisen and Carrie Brownstein. The show received many a giggle last season with its “Put a bird on it” sketch, poking fun at the art and design communities’ penchant for bird motifs. The sketch’s message actually became a larger conversation about design, but I’m happy to take the gentle-enough joke for what it is. And hey, I still like birds when the design is right. Check out the video here. That being said, we’ve got a few favorite bird pieces ourselves. Michael Graves put a bird on his famous Kettle with Bird Whistle for Alessi back in 1985, and it’s safe to say this iconic design is one of the best birds out there. A few other favorites, from classics to modern pieces, bring an avian aesthetic that will never get old. 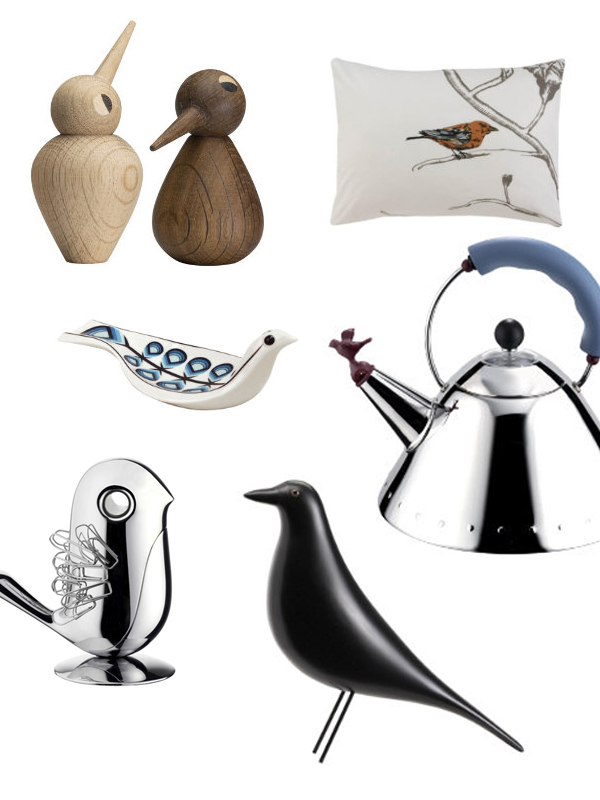 Clockwise from top left: BIRD by ARCHITECTMADE, Chinoiserie Collection by DwellStudio, Kettle with Bird Whistle by Michael Graves for Alessi, Eames House Bird by Vitra, Chirp Magnetic Paper Clip Holder by Alessi, Bird Spoon Rest by Jonathan Adler. What do you think? Are birds a part of your design gusto?